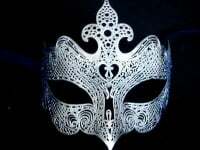 Simply Masquerade brings you this extravagantly designed and handcrafted Filigree ladies metal mask in pure white. Illuminate your look with this beautiful Donna Filigree Mask -White by Simply Masqueradet. A dazzling Venetian design this mask is created in stuning pure white metal lace and adorned with genuine Swarovski Crystal embellishment. 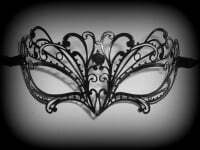 Make a chic statement with this must-have masquerade mask that will ensure you're glamorous for every party occasion. 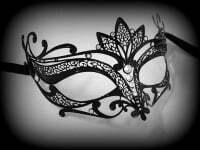 With white satin ties fitted for your comfort & security this handcrafted mask is perfect for a woman. Free UK delivery is included in the price too!